I know what you’re trying to do, and you’re not going to fool me! 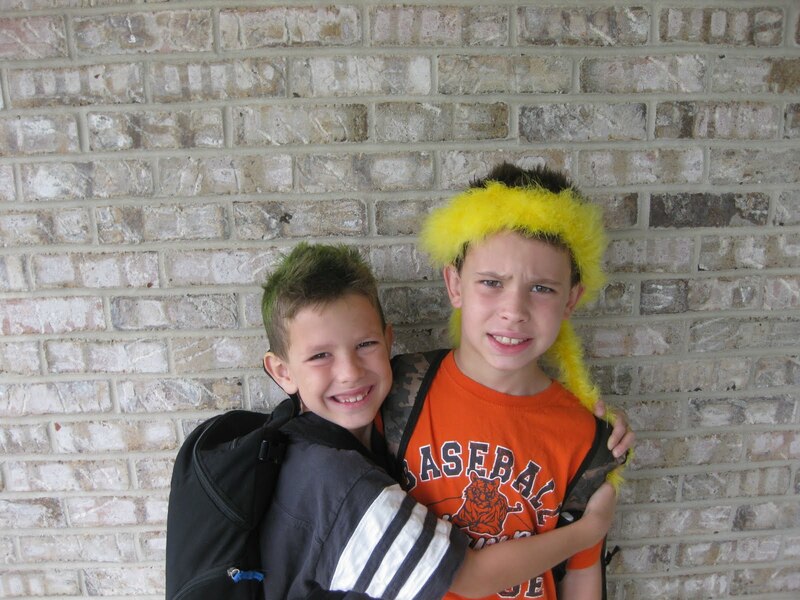 You see it was Crazy Hair Day at our home school co-op. 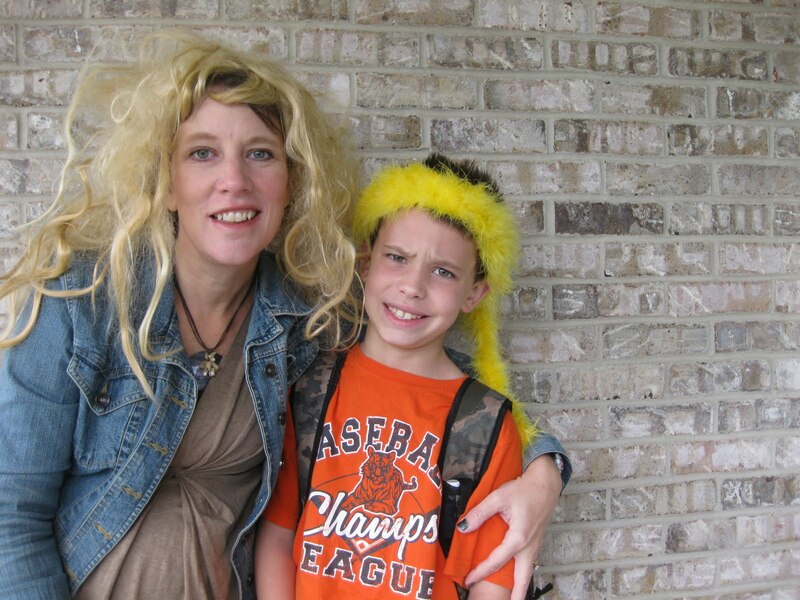 And I had spent so much time blow-drying, applying green hair coloring and plastering hair paste to the heads of my children, that I could barely get our lunches packed, not to mention find my blonde wig. I know home school was supposed to simplify our lives. But I’m not sure. We now have time for other things. Like field trips and mid-week karate and gymnastics and Awana, for example. And all of these seem to require a different costume, a different uniform or a different clothing style than we are used to. I mean, the kids used to wear uniforms. As long as we could find a clean pair of khaki pants and a navy blue shirt, we were good to go. And I stocked up sufficiently, to make sure we could go more than a week before I absolutely had to do laundry. But now? Well, let me just mention Awana, the awesome Christian program that focuses on Bible memorization and fun games each week. We love Awana. Last night was Cubs-White Sox night. Even though with our Southern Illinois roots we are Cardinals fans, I found three Cubs shirts on clearance so the kids could get their Awana points for participating in the theme night. At least I was pretty sure it was Cubs-Sox night. I know last week was Twins night, where they all had to bring a friend and dress like twins. But maybe it’s green night or pajama night or zoo animal night? Oh, I can’t remember. Then there’s pre-school. Is it still “S” day or has the letter of the day switched to “P” by now? I can’t find the latest memo, so my daughter is taking a Snake, and she can just tell the teacher it’s a Python, or a Rattler or a Garden snake if we are off by a few letters. Heck, it could be a six-foot Worm, if necessary. Then there’s co-op, which we absolutely love, as well. I remembered to bring a gift for my poor “secret sister” who will probably get short-changed in the gift-giving with brain-cell-lacking prego woman trying to make her feel special. Whew! I was pretty proud of myself for remembering that one! And I finally found my wig. It was tucked behind the rocking chair in my room — Hannah’s once smooth and silky blonde hair now a tangled mess. All the better for Crazy Hair Day. It would really be embarrassing to come with crazy hair if it’s not. Maybe this week is “Dress As Your Favorite Historical Character Week” and NEXT week is Crazy Hair Day. Or maybe last week was Crazy Hair Day, and that’s why so many people were telling me how good I looked. As I drove the kids to co-op with only minutes to spare, I realized what is going on. You see, in all of my effort to make myself blonde and my kids green and to find an object that begins with “S”, right on the heels of dressing them all in support of a sports team I don’t even like, I forgot to pack their notebooks for class, the oil pastels we were supposed to return to the art teacher and the liability form that I am now four weeks late to return. This is all a universal plot to confuse my half-conscious collection of dwindling brain cells. It’s one huge conspiracy to make me forget all of the really important stuff I’m supposed to do because I’m so busy trying to remember what kind of special outfits we need to wear. But I have a plan. I will not be thwarted. Oh, no. I might be tired. I might be iron-deficient. And I might be losing brain power. But I won’t be lulled into forgetting to pay the bills another month. They can turn off my cell phone. They can threaten me with bill collectors. But I am going to regain some of my organization skills. Oh, yes. I’m going to take care of all of these little things I have to remember so they don’t bog me down when it comes time for the important stuff. Like jackets. Our family no longer has to show up for events dressed in athletic shorts and T-shirts when it’s suddenly 45 degrees. This mama is going to get her game on. I’m packing an object starting with every letter of the alphabet in the preschooler’s backpack. Once she uses a letter, we will just remove that object. I will have to get her one of those backpacks on wheels, but that’s OK.
Oh, and the colored clothing for Awana? No problem. I will stash a shirt in every color in the back of the minivan and we will just wait outside until we see other kids going in to make sure we are wearing the correct color. I’ll throw in a couple of tie-dyes, a pair of PJs and an animal mask, just to be safe. Some people keep emergency supplies in their trunk. We will have a costume kit full of wigs, hats and capes that we can use when I can’t remember if it’s a special day at co-op. I am going to be ON TOP of things! You just wait. Here we come. Fully clothed for the weather. Hair crazy when it’s supposed to be, and normal when it’s not. But in the meantime, if you happen to see me wandering around aimlessly in a pair of PJs, wearing a crazed Hannah Montana wig and carrying a stuffed snake, just nevermind. I’m working on it. Your older son looks so happy to be posing=]Great comic relief. How in the world were you able to organize your thoughts enough to compose such a perfect post about the joys of pregnancy brain? There must be a place you could submit this like parenting magazine or something! He DOES look scared! But he pretty much always looks like that in photos. He's going through a "strained smile" stage. haha! Hysterical Emily! I am laughing out loud! I am also glad that you guys are loving co-op… I am loving having you guys there! Your family is so sweet. Oh my, your post made me smile. Great pictures of the crazy hair-dos. Sounds like you are as busy as ever. Now if I could only find an excuse for being in my PJs with my natural crazy hair! You ARE hysterical! Whew. I needed that. : ) I agree w/ Jenny. You need to publish that! Hehehe hilarious. 🙂 I feel that way right now, and I don't have nearly as good reasons for it as you do… Here's hoping things calm down for us! !